One day last week at the Krystal restaurant on South Broad Street, several customers were jockeying to greet Vickie Joiner, as if she were a full-fledged celebrity. Well, she apparently is inside this store – or is at least as much a draw as the eatery’s trademark steamed onions. “I love meeting people,” she said after saying hello to a few of the morning regulars and others. While a lot of people might be enthusiastic like that the first few days of such a job, Ms.
Joiner has been working at Krystal since the early 1980s and is the most tenured company team member in Chattanooga. The Town Creek, Ala., native and Kirkman Technical High graduate first started working at the former Krystal across South Broad Street, where the Calvary Chapel parking lot is now. She started as a crew person and eventually worked her way up to shift leader, assistant manager and then general and training manager. She also recalled the pay phones and cigarette machines the restaurant had. And like some of the other stores, the South Broad Street store also had a moving line, with separate ordering and food pickup locations. And fried chicken was also offered there for a period in a separate area. “The first time I heard the steamer go off, it scared me,” she said of the special cooking equipment. While Ms. Joiner appears to get the unintentional star attention at the current restaurant, the former South Broad Street restaurant actually had its own real local celebrities, she added. Then-company head “Rody” Davenport, the son of one of the restaurant chain co-founders, would stop by every morning at 5 in his white Rolls Royce on his way to work from Lookout Mountain and was always nice, she said, as was his wife, Elizabeth, another regular. Mrs. Davenport, the sister of noted Coca-Cola bottler and downtown Chattanooga redevelopment catalyst “Jack” Lupton, came nearly every morning and afternoon in her paneled station wagon to get a cup of Sanka, she recalled. And South Broad Street’s most famous employee – longtime WDEF radio host Luther Masingill – would also stop every workday morning and get a bacon biscuit, she said. Another longtime management employee, district manager Lyticha Jennings, started working at a drive-through Krystal in Newport, Tenn., in 1995 and eventually moved to Strawberry Plains as general manager. In April 2017 her boss had received a promotion and asked her to come down to Chattanooga as a district manager. Since her only child, a son, had joined the Army, she did not feel as tied down, so she gladly moved. “I’ve always lived in the country, so being in the big city of Chattanooga is a big difference,” she said with a laugh. But she loves the small-community feel of the work. “I just like that it’s family oriented and I get to have relationships with the employees and the customers,” she said. Like Ms. Joiner, she had evidently developed a rapport at her former restaurant in Strawberry Plains, as the customers threw a going-away party for her when she left. Shericka Blackshear, a Krystal training restaurant general manager, has also been in fast food work a long time, but actually just joined Krystal in recent years. She worked her way up to general manager at Wendy’s after growing up in Dublin, Ga. In 2014 she moved to the Dalton, Ga., area to work with Popeye’s. By chance, a Krystal district manager, Jesse McCants, observed her at work and eventually recruited her to work at Krystal. “He liked the way I worked and interacted with the customers. And he saw how I handled frustrated customers,” she said. Now she is with the Krystal at the Ringgold exit of Interstate 75. While she admits her secret long-term goal is to be a successful cake baker who owns her own bakery, she enjoys the fast-food work at Krystal dealing with customers and getting out the food. “It’s more family oriented and they care about all of us,” she said. While such longtime employees as Ms. Joiner pointed out that holiday hams and turkeys and free or reduced healthcare have long been a part of Krystal workforce offerings, the chain has also come up with other new offerings and perks, officials said. It is part of an industry-wide shift as quick-service restaurants try to become more desirable to potential workers. Ms. Jennings said that new employees now undergo more thorough training. That begins with a paid orientation in which their jobs and basic expectations are outlined, and they are given uniforms and slip shoes. Another perk is that employees now get free meals of up to a $6 value while on their work shift. And recently, Krystal followed in the footsteps of Chick-fil-A and other companies by offering its own college scholarship program for employees. Called the Square Up Scholarship program, it was started with a $500,000 gift by Krystal chairman Michael Klump and awards $2,500 scholarships to selected employees to pursue higher education opportunities. 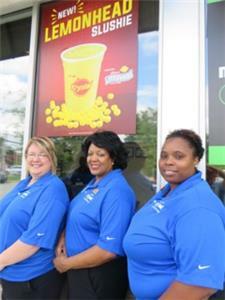 Ms. Joiner said she has three young people working at her store, and such perks can become great incentives. And the company has come up with other new offerings, from such new food products as pimento cheese bites and frozen Lemonhead Slushies, to a new #SquareTalk and #LiveALittle rebranding and unconventional marketing campaign designed to reach millennials and others. The marketing has included Krystal partnering with The Tombras Group advertising agency in Knoxville to develop ways to track social and digital advertising with real-time walk-in business, officials said. Tombras has also been involved with the locally based MoonPie’s social media advertising. And many might say the three Krystal managers and others have provided pretty good marketing, too. Ms. Joiner simply said she loves meeting and dealing with people, and working at Krystal has provided a perfect opportunity for that. “If you look at people beyond what you see, you can see something and know what that person’s going through,” she said regarding how she tries to treat people.